After enjoying enormous success following the release of the Chevy Corvette in 1953, other auto brands upped the ante with competitive models aimed at taking out this all-American sports car. While the Ford Mustang was designed to compete with the ‘Vette, the blue oval brand had no clue that Chevy had another muscle car up its bulging sleeve. Introduced for the 1967 model year, the Chevy Camaro was a direct response calculated to put Ford back in its place. While the Mustang did not entirely succumb to the incredible versatility and increasing popularity of the Corvette, it has certainly taken a hit thanks to the enduring persistence of Chevrolet, and the creation of the Camaro. The Chevy Camaro may take second place next to the brand’s iconic Corvette sportscar, but the Camaro is a popular choice among muscle car enthusiasts at new car dealerships across the nation. Some of the most exciting new Camaro models recently introduced are concept cars that we can only hope will one day appear on dealer showroom floors. Until that day (hopefully) arrives, we can check out a few of these incredible performance coupes that we already dream of driving. Automotive brands release concept vehicles from time to time, that either serve as a gauge to determine widespread interest in the model, or as a pipe dream for those of us who wish they would magically appear in our driveways. While a good majority of concept vehicles will eventually make it into limited production somewhere down the line, a few slip through the cracks and are never produced for consumers. The fate of the Camaro concepts that were unveiled at SEMA and other auto shows this year remains to be seen. Until we find out whether they will grace Chevy dealerships in the coming years, or simply dissipate in our dreams, we will have to settle for drooling over their potential glory. Check out a few incredible 2017 Camaro concepts that have us pleading with the automotive gods to someday offer for sale. 2017 Camaro SS Slammer Concept: In what is possibly the most drool-worthy version of the Camaro ever imagined, comes the Camaro SS Slammer concept. Designed to inspire muscle car fans from sea to shining sea, this Camaro epitomizes everything that this nameplate has represented for the past fifty years. Debuting at the 2017 SEMA Show in early November, the 2017 Camaro SS Slammer proved to be the definition of show stopper.John Cafaro, the Executive Director of Global Chevrolet Design, is largely responsible for birthing this incredible concept. Cafaro had this to say about the SS Slammer concept: “The Camaro SS Slammer concept is a design exercise intended to take the Gen 6 Camaro’s proportions to the extreme, pushing boundaries to evoke reactions and inspiring personalization on behalf of other Camaro owners. From styling accessories to performance parts, the choices from Chevrolet for new Camaro owners are almost endless.” Its low-slung stance, 22-inch front wheels and larger 24-inch rear wheels, clad in chrome, just beg to be taken out on the track. Complete with an air-adjustable suspension, drivers lucky enough to get behind the wheel of the SS Slammer concept will bask in the performance glory that this Camaro model exudes. Under the hood sits a 6.2-liter V8 engine rated at a heart-racing 455 horsepower, and a matching 455 lb.-ft. of torque. The Camaro SS Slammer concept’s intense engine block is mated with a six-speed manual transmission complete with Active Rev Match technology, and a deep growling stainless steel exhaust system. Truly a one of a kind concept that we can only hope will one day show up at DePaula Chevrolet, so we can enjoy our own up-close encounter. 2017 Camaro Turbo AutoX Concept: One of the more surprising Camaro concepts brought to the 2016 SEMA Show in Vegas this year is the Turbo AutoX version of the Camaro. Equipped with a Chevrolet Performance suspension lowering kit, stiffer springs, and a Plus Performance handling kit, the Camaro Turbo AutoX was designed to take corners without reducing speed, or missing a beat. Designed to perform in the sport of AutoCross, the Turbo AutoX concept features a GoPro camera mount on the front bumper, so that drivers and enthusiasts of the auto sport don’t miss a moment of the action. Jim Campbell is the General Motors United States Vice President of Performance Vehicles and Motorsports, and says that, “This concept pushes Camaro in a new direction, integrating new performance parts that make the most of the turbocharged Camaro’s lightweight dynamics.” To help increase the car’s performance, regardless of how many laps it is required to complete, Chevy outfitted the 2.0-liter engine with a cold-air intake system for optimal performance across the rpm band. The Turbo AutoX concept’s turbocharger adds twenty pounds of boosted energy, eliminating any potential lag out on the track. The version of this Camaro concept that Chevy chose to showcase at this year’s SEMA Show, featured a bold exterior look that may not appeal to the average driver. Adam Barry is the Chevrolet designer responsible for the brazen color choice, and gave this insight as to why he choose the color that he did, “Appearance is very important to the owners of vehicles like this, and the Camaro Turbo AutoX concept was designed to be both race- and show-worthy. 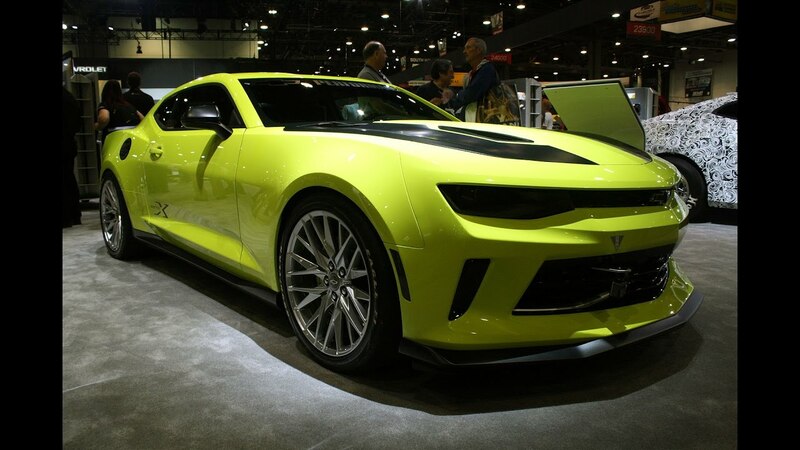 The new Shock Yellow color on the concept reaches out to the new generation of enthusiasts and explores how the Gen 6 Camaro looks in brighter, bolder hues.” Perfectly designed for the unique world of AutoCross, the 2017 Camaro Turbo AutoX Concept is less likely to make it into the brand’s lineup for future sales than the SS Slammer version of the muscle car. Whether or not this holds true remains to be seen, and if it were up to us, both cars would find their way to Chevy dealers in 2017. If you are eager to get behind the wheel of a 2017 Chevy Camaro, and don’t want to wait around for a possible concept to become available, be sure to take the muscle car for a test drive down at DePaula Chevrolet. Once you feel the power at your fingertips, you won’t want to drive anything else ever again.